The following impressions completes our ongoing review of the full Tales from the Borderlands series. Be sure to catch up with our impressions for Zer0 Sum, Atlas Mugged, Catch A Ride, and Escape Plan Bravo. 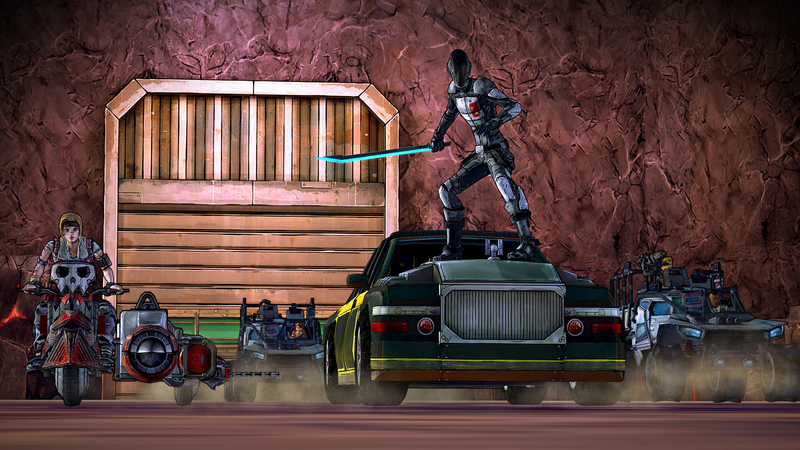 Telltale set up quite a cliffhanger prior to the finale of Tales from the Borderlands. As any good cliffhanger should, it set the stage for an incredible final chapter and 'Vault of the Traveler' delivers in spades. It does far more than wrap up the lingering plot threads in a satisfactory fashion. It even goes farther than shuffling pieces of the Borderlands universe in a logical manner that makes sense for future installments of the main series. It stands as one of the single best finales that Telltale has put together, period. Those coming in after the events of 'Escape Plan Bravo' know the precarious situation that the main characters find themselves in. The main focus of the story was now on Handsome Jack and the galactic despot looking to make his return to the land of the living. Telltale's narrative unfolded in such a fashion that the moment of Jack's turn works in more than one sense, whether it comes across as a friend's betrayal or as the lingering horror finally being unleashed. 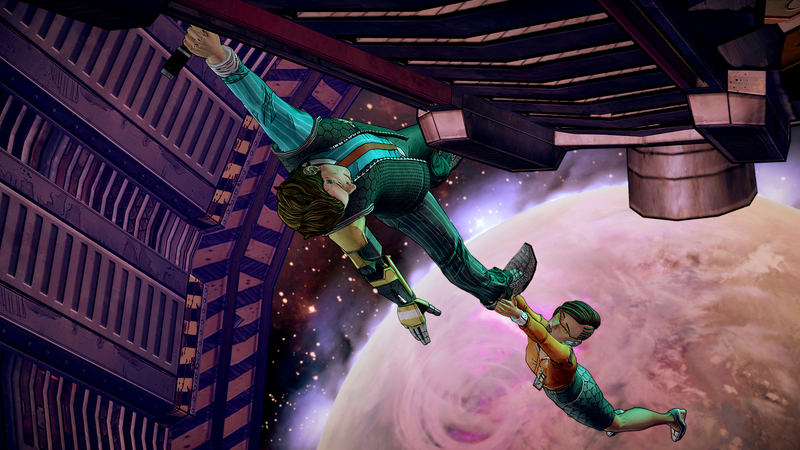 The expectation was for the entirety of the episode to be devoted to the fight against Jack, but Tales from the Borderlands defied those expectations by essentially dealing fully with this plot well before the halfway point of the final episode. So what does that make 'Vault of the Traveler?' It capably acts as both an ending and as an epilogue for the game's main characters. By this point, the fish story element of the game is out the window, signifying that the time for lying and embellishing is over. The finale deals with the ending of Rhys and Fiona's journey, spends a good chunk dealing with the consequences of its outcome, and uses the rest of the episode to deal with unfinished business and tie up any loose plot threads. That's what makes Tales from the Borderlands such a satisfying story as a whole. One of Telltale's bigger issues in recent games is that regardless of choice, the destination is the same. While that's still true to an extent, the journey can vary in so many ways through dialogue choices and big decisions that the actual story leading up to that final destination can be completely different. The tone and the characters of individuals can be different from person to person. While that's not unique to Telltale games, Tales from the Borderlands seems to embrace this idea far more than past efforts. What's really interesting about the way 'Vault of the Traveler' deals with actions across five episodes, however, is that the way the main characters treat certain people does matter. And it matters prior to the final episode's climax when it takes over a dozen crucial decisions made over the course of the full story, determining how the final sequence will play out. When certain decisions lead to the '(X) will remember that' notification, many of those instances do end up mattering in the end. The other major thing that the climax accomplishes is that, depending on how the game was played to that point, it opens the door to numerous different ways that the story can play out. Without spoiling exactly what this is, it's entirely possible to play this final sequence in several different ways to witness a variety of conversations, dialogue exchanges, and interactions. Even the quick-time events will take something of a different turn. Speaking of which, those that don't like the quick-time events that have become a big part of Telltale games may not very happy with this mechanic's evolution. Later in 'Vault of the Traveler,' these instances will go from flicking the analog stick in one direction or hitting a button to inputting a combination of buttons. The context of the scene makes sense, but it won't be any easier for anyone tiring of QTEs to swallow. "Everyone thinks they're the hero of their own story." Best of all, Tales from the Borderlands features some of the best writing I've seen from Telltale so far. Let's take the most brilliant example of it by looking at the arc centered around Rhys and his relationship with Handsome Jack. The way it's written will strike a strong chord with Borderlands fans, in particular. There are many instances where the rise of Handsome Jack is referenced and along the way, the parallels between Jack and Rhys' current struggles trying to climb the corporate ladder are highlighted. What's brilliant here is that regardless of how Rhys is played, whether as a ruthless middle man trying to backstab anyone on his way to the top or someone trying to make his own way, he ultimately ends up following in Jack's path, regardless. Without spoiling the events of 'Vault of the Traveler,' observe the manner in which Rhys goes about finding his solution. Even if tries to act arrogant, humble, or well-intentioned, all of it follows the path of Jack, anyway. All of this goes back to the idea of destination and journey. Regardless of where the story's destination ends up, the story told in getting there is often unique for different players, but still makes perfect sense. But best of all, even in the face of danger and increasing tragedy, the game doesn't entirely forsake its humorous tone. Rhys and Fiona are still good for sharp quips and quick laughs, with the characters' chemistry with others helping provide smiles, even as the story itself gets noticeably darker. Tales from the Borderlands succeeds on a number of fronts. As the latest chapter of the ongoing Borderlands story, it's a fine progression and sets the table for a post-Borderlands 2 world. As a story-based game, it features some of Telltale's best writing to date and its humor separates it from the developer's more recent efforts. It also features a shocking amount of replay value and actually made me want to play the finale more than once to see the various character interactions, as well as find any little things I might have missed. The actual final seconds of the story itself may be infuriatingly cliche to some, but after the experience of the journey, it's forgivable. 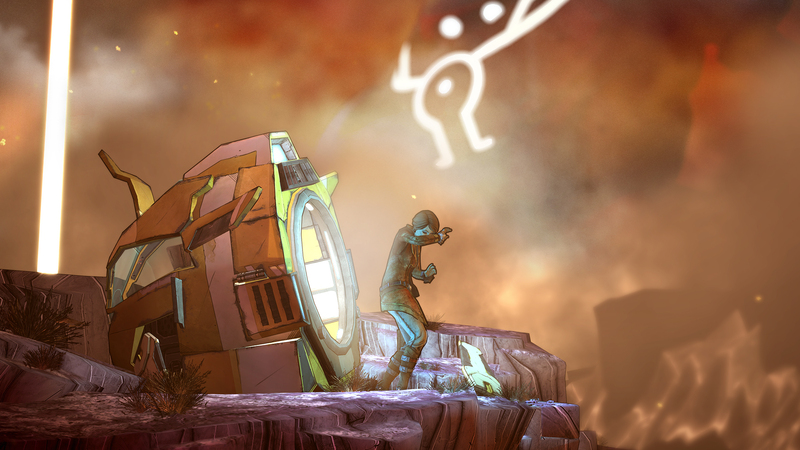 Despite that, Tales from the Borderlands marks some of Telltale's best work to date. This review is based on a Steam code provided by the publisher. Tales from the Borderlands is available now on PC, Mac, PlayStation 4, and PlayStation 3 for $24.99 for all five episodes. The final episode 'Vault of the Traveler,' will be available on Xbox One and Xbox 360 tomorrow and on iOS and Android on Thursday. The game is rated M.